Umu oozes an air of exclusivity and mystique. Located at the end of a secluded road in Mayfair, one enters the restaurant through a large automatic wooden door draped with a dark curtain. The interior is dimly lit and walled with dark wood and mirrors. Umu offers an enticing range of contemporary and creative dishes on its menu. Since the prices on the à la carte menu are quite steep, you might as well try the Kaiseki Tasting Menu for £100. While most dishes were delectable, some of them simply did not taste right. The sashimi was exquisite, but the cup of green tea (which you pay £5 for) was only lukewarm when it was served. The staff were generally informative, but slightly impersonal at times. (1) First on the Tasting Menu was the Icelandic sea urchin with foie gras custard and umadashi jelly, which was delicate, flavourful and extremely fresh. 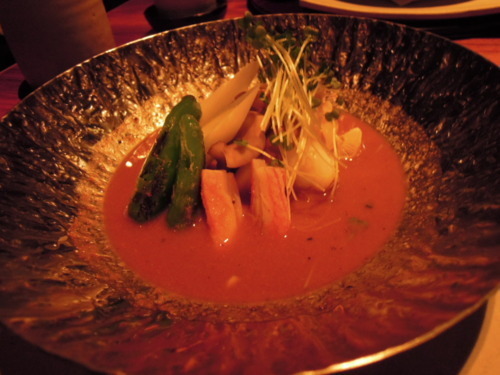 (2) The second item on the Tasting Menu was the Turbot and snow crab hot pot with Tokyo leek and mushroom, which tasted like a lobster bisque with a Japanese twist. There was nothing wrong with the taste, but it was just something that you would not have wanted more of after you finished. (3) The third course was the Wild mallard with “Jibuni” sauce. 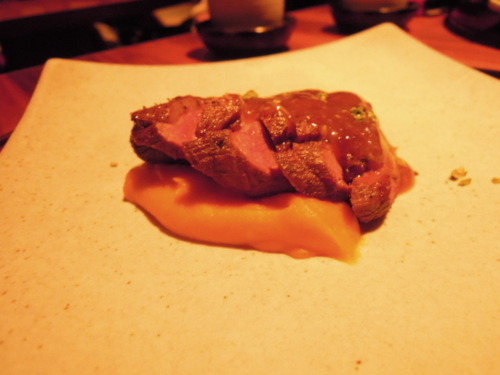 The mallard had a gorgeous, chewy texture, and was cleverly matched with a light pumpkin purée. 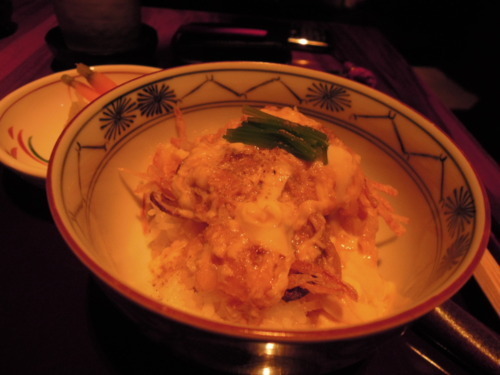 (4) The fourth item was the Kakiage gohan of burdock and root vegetable with egg sauce. In case you are wondering, “gohan” means steaming white rice. This was basically a bowl of rice, which tasted a bit bland. Enough said! 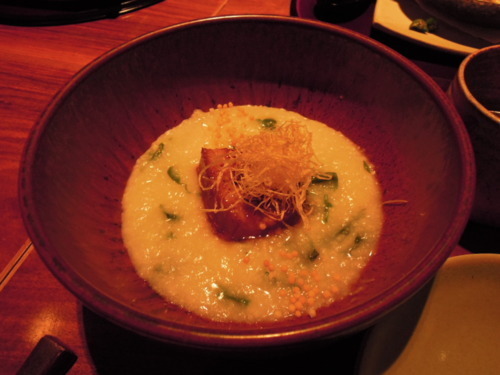 (5) As a high-end Japanese restaurant, Umu ensures that it uses only top-notch ingredients. 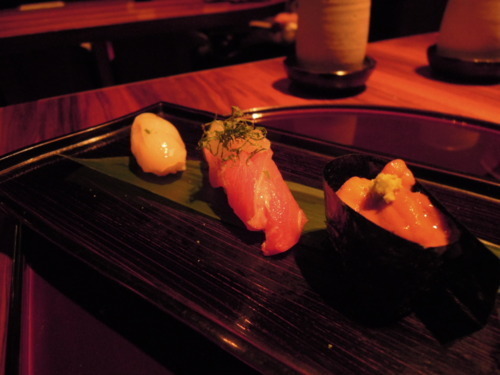 Therefore, it was no surprise that the Chef’s selection of sushi was startlingly fresh and of exceptional quality. This sushi selection and the sea urchin with foie gras custard (the first course we had) were definitely the winners of the meal! 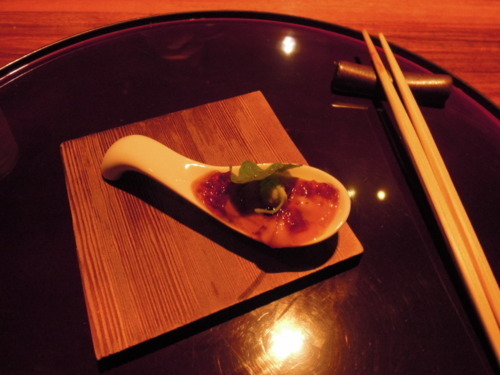 (7) I have heard great things from my friends about this Foie gras, lily root, winter mushroom in harumaki cup (£8). The “harumaki cup” was made from a spring roll wrapper, and this could be eaten either as a piece of sushi or as a canapé. 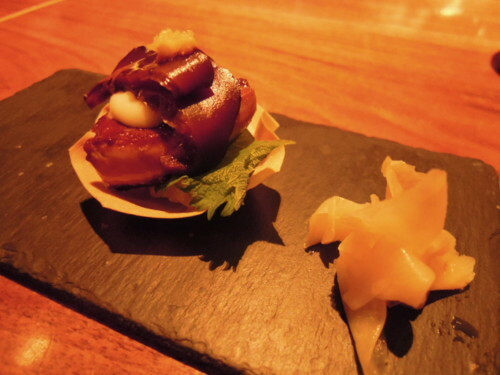 We turned out to be very disappointed, as the winter mushroom and the crunchy harumaki cup distracted from, rather than complemented, the richness of the foie gras and the different flavours did not go well together. 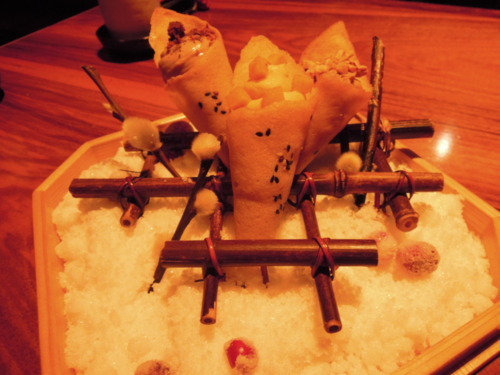 (8) Nicely perched on the rack were the Kinako cones with three seasonal flavours, which were the desserts on the Tasting Menu. Delicate and crispy, the cones came with creative and fruity fillings! The mango cone was particularly summery and delightful! Umu provides a swanky experience which does justice to its Michelin one-starred status, but for the expensive prices paid, we did not leave the restaurant feeling completely full or satisfied!